Many of the enthusiasts viewing this website are four wheel drive (4×4) enthusiasts. Have you ever wondered where the 4×4 originated in the United States? I set out to research the origin of American built 4×4’s and it turned in to more of a project then I was anticipating. Depending on who you talk to or what you read, there is a few different names that come up as the creator of the 4×4. Below is a break down of introductions of 4×4’s based on the year introduced. 1901 – Cotta Automobile Company – In 1901, Charles Cotta built the Cottamobile In Lanark, Illinois. He used a simple and thoroughly practical device using chains by which the power of the motor was applied equally and individually to each of the four wheels, making each wheel a traction wheel. It was to be a thoroughly reliable vehicle in all seasons and conditions of weather, a feature not possessed of by any other vehicle on the market. The motive power of the machine was steam, thus doing away with all the objectionable noise that was so characteristic with the gasoline and electric vehicles. Although Cotta began building the car in 1901, it wasn’t completed until 1904. The Cotta Steamer also had four-wheel steering and a special type of transmission with non-clashing gears. Cotta advertised the cars through 1902 in magazines such as the Cycle and Automobile Trade Journal, from which the ad below was taken. In 1903, Cotta sold the designs and patents to the Milwaukee Four-Wheel Drive Wagon Company, which built small numbers of 4×4 cars and trucks until 1907. Cotta went on to established the Cotta Transmission Company where he designed and manufactured truck transmissions for many years. In the 1940’s, Cotta began a shift to industrial products, off-highway and construction vehicle markets. In the mid 1960’s, Cotta added a line of high-speed transmissions. Over the years, Cotta diversified into various products including hydraulic pumps and coal augers. Today – Cotta (with production facilities in Beloit, Wisconsin) is a trusted, leading manufacturer of top-quality, precision-engineered transmissions for a wide range of specialized mobile and stationary applications: vocational trucks, defense, off-highway, aerospace, heavy industry, well-drilling, mining, marine and more. Although Cotta likely built the first four wheel drive car in the United States, none are known to have actually been sold under the Cotta name. 1904 – Couple Gear Freight Company – Starting in 1904, the Couple Gear Freight Company of Grand Rapids, Michigan, built four-wheel drive electric trucks with four-wheel steering that could be operated independently. The trucks used a geared motor built into the hub of the wheels. The setup was useful for maneuvering loads into tight spots by going almost sideways. The trucks were built in 1, 2, and 5 ton capacities, and the top speed was 8 mph for the lighter trucks and 6 mph for the 5 ton trucks. In 1908, a hybrid truck was built that had a 4-cylinder gasoline generator, thus eliminating the batteries and the transmission. Couple Gear remained in business until 1922. 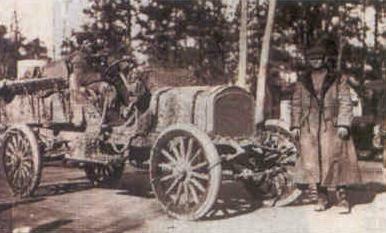 1905 – Charles Van Winkle – Charles Van Winkle of San Joaquin, California, built a prototype 4×4 touring car in 1905. His four-wheel drive concept used a single driven shaft that connected the front and rear axles. Van Winkle sold the patents to the newly formed Stockton Four Auto Drive Company in Stockton, California, but the idea went nowhere. Van Winkle built two-wheel drive trucks in 1913-1914 in Atlanta, Georgia. Van Winkle never sold 4×4’s to the public. 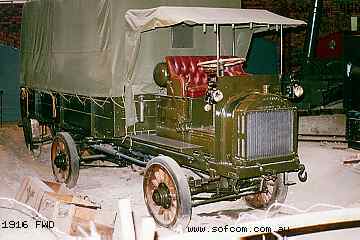 1906 – American Motor Truck Company – In 1906, the American Motor Truck Company (1906-1912) built an experimental chaindrive 4×4 truck with four-wheel steering. This vehicle, owned by collector Wayne Coffman, is still in existence and shown below. In 1911, the company marketed a line of similar 1, 2, 3, 5, and 10 ton 4×4 trucks. Like the prototype, the axles were a platform type and pivoted in the center, complete with springs. The trucks used horizontally opposed 2 or 4 cylinder engines of 20 to 60 hp and had top speeds from 8 to 15 MPH. The transmission was a two-speed, planetary design. 1906 – Duplex Power Car – In 1906, Duplex Power Car of Charlotte Michigan offered a 3/4 Ton Model B, 2-cylinder 14hp, 4×4 automobile. Some believe the Duplex Power Car Company was the first commercially viable 4×4 in the United States. It’s difficult to prove since Duplex’s records were destroyed in a fire during the 1920s. Strangely enough, the company eventually switched to building fire engines as Simon-Duplex. The first Duplex was the 3/4 ton Model B that was in production at least until 1909. After a two year production lapse, Duplex went back into production in 1913 with a totally new design, The Model B (below top) used a 14hp, 2-cylinder engine mounted under the seat. 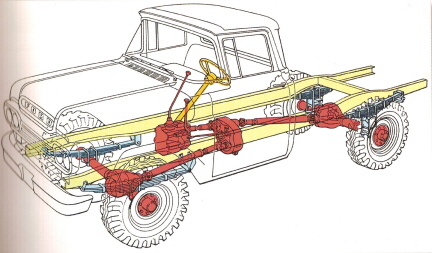 The drive system used a differential mounted atop a solid-beam axle. Shafts extended to an internally toothed ring gear in the wheel, and a spur gear on the end of the axleshaft drove the wheel. This drive setup was replaced by a more conventional design by the time the 1919 truck (below bottom) rolled around. 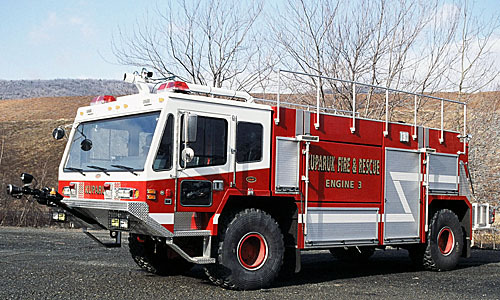 Duplex stopped producing 4×4 trucks and went on to building fire truck chassis’s. This Saulsbury Class A pumper (above) was manufactured for the Telford Fire Company in 1992. The apparatus is built on a Simon-Duplex chassis and has a Hale pump. No, it’s not four wheel drive. Simon-Duplex stopped making trucks somewhere in the 1990’s. 1908 – Badger Four Wheel Drive Auto Co / FWD Co / FWD Seagrave – In 1904, blacksmith Otto Zachow obtained a franchise to sell Reo cars. While demonstrating the car, Zachow slipped off the road, and accidentally discovered that the car had better traction in reverse. He decided that automobiles would not be practical until their power was transmitted to all four wheels so their front wheels could pull their hind wheels out of mudholes. Otto Zachow and his brother-in-law, William Besserdich, built and tested a steam-powered 4×4 that broke new ground in America by debuting the first steerable, integrated front driving axle. The vehicle was powered by a cross-compound steam engine, but the drivetrain was very much like those we use today. The first tests in October 1908 showed the value of the four-wheel drive setup. The vehicle could negotiate the terrain the other three motor cars in Clintonville, Wisconsin, dared not traverse. A young local lawyer named Walter Olen helped Zachow patent his invention in 1908. In 1909, the revamped Zachow/Besserdich creation became a force to be reckoned with in automotive circles. With the steam plant replaced by a 45hp Continental four-cylinder and with a gorgeous red body installed, this vehicle was the pinnacle of 4×4 performance for the day. Nicknamed the Battleship because nothing could stop it, the vehicle was tested extensively on the backroads around Clintonville. 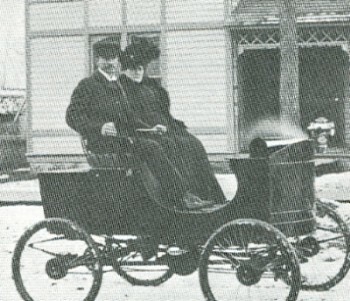 Zachow and Besserdich teamed up to form the Badger Four Wheel Drive Auto Company and hoped to offer America an automobile suitable for all types of weather and road. Badger began the production on a line of 4×4 touring cars but ran into business problems. In 1910, Walter Olen incorporated the company with him as president and changed the name to the Four Wheel Drive Auto Company. Otto Zachow received a block of stock. FWD sold their first vehicle in 1911. Their first car was a White steamer fitted with Zachow’s 4WD. A $1,000 prize was offered for any car that could follow the Battleship cross-country for 15 minutes. Hundreds of cars tried but none collected. After building only seven touring cars, FWD realized the market was not ripe for such a vehicle but reckoned the truck market was ready for a 4×4. No sooner had discussion begun when the company learned of a U.S. Army cross-country test. At that time, the Army owned 12 trucks. Army leadership was not sure about the new-fangled horseless carriages, but nonetheless, a test was undertaken to determine the feasibility of their use. FWD sweet-talked an Army representative, Captain A. E. Williams (seen below standing in front of the car), to the factory for a test drive. As a result, the Army purchased one of the FWD touring cars for the test. The car was stripped of its rear body, a flatbed was added, and it was called a 1-1/2 ton truck. The Scout Car, as it was later known, proved the benefits of all-wheel drive by outperforming the other three surviving trucks by a large margin on the eight-week 1,500-mile winter test early in 1912. It spent most of its time dragging the other rigs though mudholes. About 1914 Zachow and Besserdich sold out for $25,000. That was a mistake, for General Pershing had found several FWD trucks useful while chasing “Poncho” Villa across Mexico. When War broke in Europe, the Allies (British) began buying FWD trucks in quantity. When the U. S. joined the war, the U. S. Army took over FWD’s entire output. By 1918 it had bought 16,000 FWD. trucks, and spare parts equivalent to 14,000 additional trucks. War’s end almost killed the FWD Co., but it survived supplying parts for the many war-surplus FWD trucks now in civilian hands. It also made 4WD utility and construction trucks. Since the War, FWD has thrived in the commercial field with an early cab-over-engine truck and with such husky specialized products as snowplows, fire-engines and machines capable of installing telephone poles in five minutes. In 1958 the company’s name was changed to simply FWD Corporation. FWD Corporation is based in Clintonville, Wisconsin with additional offices in Richmond, Virginia and Ontario, Canada. In 1963, FWD bought out Seagrave, the oldest continuous manufacturer of fire apparatus in North America and brought the leader in the fire industry to Clintonville, Wisconsin. In 1981, Randolph W. Lenz moved into heavy-equipment manufacturing, buying the assets of the FWD Corporation, a bankrupt manufacturer of snowplows and fire trucks in Clintonville, Wisconsin. James Hebe later joined a group of private investors managed through Ballamor Capital Management Inc. to buy the assets of Seagrave Fire Apparatus LLC and its parent company, FWD Corp., from Corsta Corp. in 2003, becoming CEO of the company. The company is now FWD Seagrave. In 2004, FWD Seagrave acquired Schmidt Equipment & Engineering, which makes snowplows. 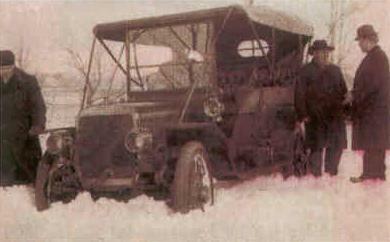 FWD Seagrave felt that the acquisition of the snowplow company was a chance to reintroduce the four-wheel drive, heavy-duty chassis. They intend to develop a chassis and snow-removal equipment line that complements and expands what they now offers. Schmidt makes the Wausau and Snogo brands of heavy-duty snowplows and snowblowers used by municipalities and airports. Founded in 1978, the New Berlin company is the largest maker of airport snow-removal equipment in the country. Today, snow clearance equipment, fire apparatus, heavy haulage trucks and 4×4 special purpose vehicles are available from the FWD Seagrave. 1909 – Walter Truck Company / KOVATCH Mobile Equipment Corporation (KME) – Walter specialized from the outset in 4×4 trucks. Its founder was William Walter, a Swiss engineer who emigrated to New York in 1883. He began by making confectionery machinery, but in 1898 turned his talents to motor cars. The first Walter truck was made in 1909, and this formed the basis for his first 4×4 of 1911. The early trucks had a dashboard radiator and “coal scuttle” bonnet (hood) reminiscent of the old Renault and Latil designs. 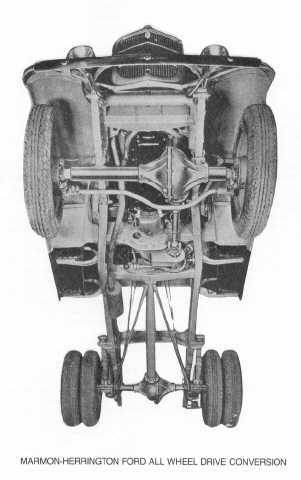 It used a spur-and-ring gear-axle design similar to the early Duplex and the later Jeffery/Nash Quad. Some conventional rear-wheel drive versions were also built. Until 1920 Walter built its own gasoline engines, but later used Waukesha units. The heaviest truck went up to 7 tons payload. By the mid 1920s the trucks began to take on their distinctive snout with the front axle set back under the cab – a Walter trademark for much of its history. In 1929 the first Snow Fighter snow-clearance truck was launched, and during the 1930s the company diversified into specialized fire appliances, concrete trucks, articulated dump trucks and logging outfits. Some 4×4 medium artillery tractors were supplied to the army during World War II. Over the past five decades Walter has remained a major force in the specialized all-wheel drive market, building a wide range of snowplows, crash tenders and similar machines, some with power ratings up to 540bhp. The Walter Corporation was located in Guilderland Center, New York and was eventually bought by The Kovatch Organization. Kovatch produces fire apparatus, runway snowplows and fuel delivery trucks. 1913 – Thomas B Jeffrey Company – In 1913, the Thomas B. Jeffery Company debuted a prototype four-wheel-drive, four-wheel-steer 2 ton truck it called the Quad. The truck went into production in 1914, and with WWI just beginning in Europe, it was just in time to be snapped up by the British, French, and Russian armies as well as by the U.S. Army in small numbers. In 1916, the Thomas B. Jeffery Company was sold to Nash, and the Quad became the Nash Quad. It was built and sold in large numbers during WWI, but sales trickled after 1919,and the Quad went out of production in 1928. Shown below is a 1919 Nash-built Quad. 1918 – Oshkosh Motor Truck Company – In 1917, the Oshkosh Motor Truck Company was formed out of the Wisconsin Duplex company that had begun earlier. The two founders were none other than William Besserdich, one of the founders of FWD, and Bernhard Mosling, also lately of FWD. 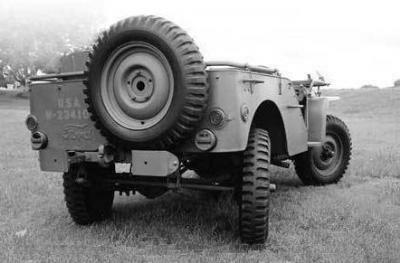 Their first 4×4, nicknamed Old Betsy, was an advanced design, featuring pneumatic tires and an automatic locking center differential. Oshkosh built a number of trucks in the 1 to 3 ton range into the 1920s, but it eventually specialized in really big all-wheel-drive trucks and has prospered to the present day. 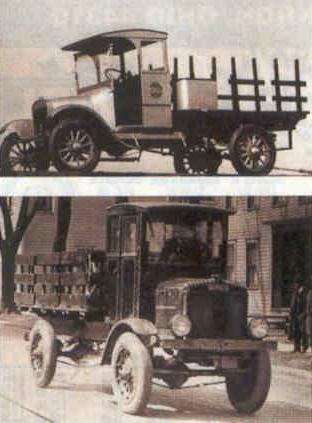 Old Betsy has survived and is shown in the top of the following photo, and the Oshkosh Model A is shown in the bottom of the following photo. When it debuted in 1918, the Model A was the most advanced production 4×4 truck in the world. 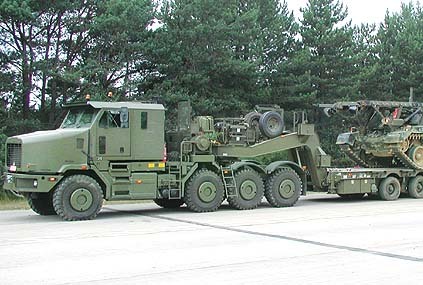 Today, Oshkosh still produces heavy duty 4×4 trucks such as this Heavy Equipment Transporter shown below. Oshkosh Corporation is a leading manufacturer and marketer of specialty vehicles and bodies reporting in four primary business groups: Access Equipment, Defense, Fire & Emergency and Commercial. 1931 – Walter Marmon & Arthur Herrington – formed Marmon-Herrington. To start, they built 1-1/2 ton trucks of their own design. In 1936, the Indianapolis based Marmon-Herrington company jumpstarted the light truck 4×4 industry by converting a Ford half-ton truck to four-wheel drive. Marmon-Herrington (M-H) began converting Ford trucks to 4×4 in 1935 rather than building their own from the ground up. They specialized in 4×4 and 6×6 trucks of 1-1/2 ton and larger and even built half-track military vehicles. A request from the Belgian government in 1936 planted the idea of converting light trucks to four-wheel drive. At the time, there were no 4×4 trucks under 1-1/2-tons being built, but the Belgian military felt a need and already owned a number of Ford built trucks, including M-H conversions. Chief Engineer Bob Wallace found the idea doable and purchased a used 1935 Ford 1/2 ton from a nearby used car lot, made the conversion, and by July of 1936, the truck had been very successfully tested on the King Ranch in Texas. It’s capability blew everyone away and that performance standard remained unbeaten until the first jeeps debuted in 1940. By 1937, M-H offered conversions of many Ford light trucks and even certain car models, including woody station wagons. The conversion was done at the factory in Indianapolis, ironically the old Duesenburg factory. You ordered a truck from your local Ford dealer and it was shipped to Indy for the conversion. The late 1930s was Marmon- Herrington’s heyday. By 1940, the bigger truck manufacturers, most notably Dodge, had entered the light 4×4 market for the war effort. M-H was simply too small to compete with the bigger dogs and though they carried on with light truck conversions until the early 1960s, they never could compete with “The Big Three” once they got on the band wagon. Unlike many other of the old timers, Marmon-Herrington remains in business, still converting trucks to four-wheel drive. These days, they do only the big stuff for specialty commercial markets. That goes right back to one of their founder’s, Colonel Arthur Herrington’s original mandate. 1934 – Dodge Brothers – In 1934, Dodge built its first 4×4 truck in the form of the K39x4USA. This 1-1/2 ton truck used the standard 1934 Dodge truck line as a basis but featured a Timken-built front axle and transfer case. This Timken transfer case was the first to offer a part-time position for the transfer case and let the front axle freewheel. 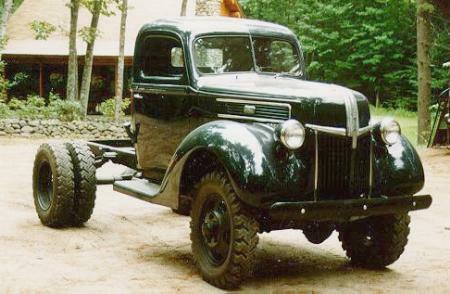 A similar truck was made in 1938 and called the RF-40x-4USA. Both trucks were very successful and put Dodge on the 4×4 map. It was the first 4 wheel drive in which the driver could shift into and out of 4 wheel drive mode using a shift lever inside the cab. 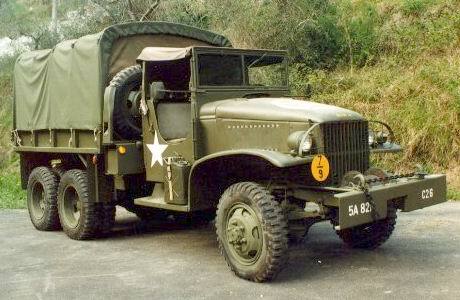 Dodge also built 4WD 1-1/2-ton military cargo trucks in 1938, 1939 and 1940. The government then decided they preferred to have Dodge build light-duty 4WD trucks and contracted for a series of half-ton trucks. The 1940 VC Series trucks used the civilian truck’s front end sheet metal and carried various body types. A total of 4,641 VCs were produced. They performed excellently and convinced the Army they were on the right track. They were replaced in 1941 with the WC Series half-ton trucks. 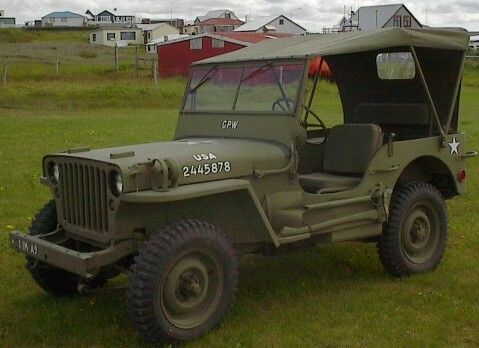 This series featured military front sheet metal. A total of almost 78,000 WC half-tons were built in several body styles. These trucks were a decided improvement over the VC Series but nevertheless the Army still felt they were lacking. Dodge engineers returned to the drawing boards and developed the 1942 3/4-ton WC Series trucks. These trucks had a lower silhouette, were wider, more powerful, heavier and offered in a broader range of body types. After intensive testing the Army approved them for mass production. A total of 225,196 trucks of all body types were produced for WWII. The civilian Power Wagon was introduced in 1946. It was based on the 3/4-ton Army truck’s chassis with a civilian cab and a purpose designed 8-foot cargo box. It rode on a 126-inch wheelbase chassis and featured the 230 cubic-inch flat head six engine, a two-speed transfer case, a 4-speed transmission with a power take off opening which would send power to the front and back of the truck for operating auxiliary equipment and big 9.00/16-8 ply tires on 16X6.50 inch 5-stud wheels. The nominal one-ton rated Power Wagon’s maximum GVW rating was 8,700 pounds. Its maximum payload was 3,000 pounds. 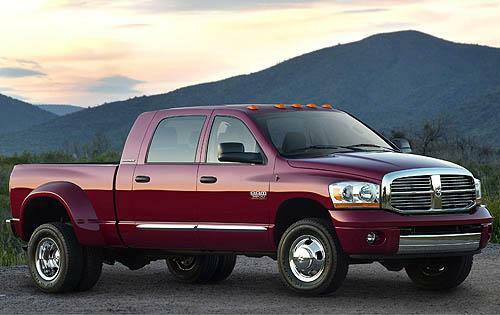 Today, Dodge is still producing a variety of 4-Wheel Drive trucks. 1939 – The ACK-101 was GMC’s entrance into the light-duty 4×4 wars of the late 1930’s. While a good truck, it was not successful in beating out Dodge for the big 1/2 ton 4×4 military contract of 1940. GMC didn’t suffer, building some 500,000 trucks for WWII. During World War II General Motors was a primary supplier of military vehicles to U.S. and Allied governments, contributing much support to the war effort. The most outstanding of those vehicles were the GMC model CCKW350 series, 2-1/2 ton 6×6 trucks (called the “Deuce-and-a-half” by GIs). From 1940 through 1945 GMC built over 528,000 6×6 military trucks, most of which were CCKW350s. 1940 Ford Motor Company – 1940 1/2 ton 4×4’s – Ford’s GC 1/2 ton truck program definitely predated the company’s GP 1/4 ton developments. It probably also predated Bantam’s 1/4 ton idea, because the competition for the 1/2 ton contract started as early as 1939. Ford unsuccessfully entered several 1/2 ton prototypes in two body styles, including pickups and a command car. 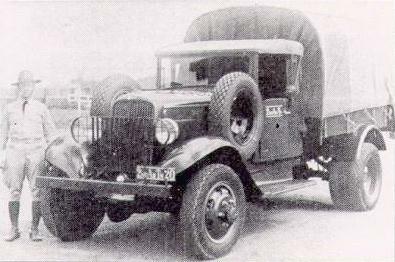 A 1-1/2 ton cargo truck was also produced. Some were fitted with the then-new 226ci flathead six, and others had the quintessential Ford flathead V-8. The United States was drawn into World War II on December 7, 1941, shortly after Ford’s 1942 models were introduced. The order was given to stop production of civilian vehicles on February 10, 1942, so assembly plants could be converted to producing war materiel. From the time the plants closed through to the end of the war, Ford concentrated its efforts into building B-24 Liberator bombers; aircraft engines; tanks; Jeep-type military vehicles; wooden gliders; and military versions of the 1942-era pickup trucks, cars, and heavy-duty trucks. 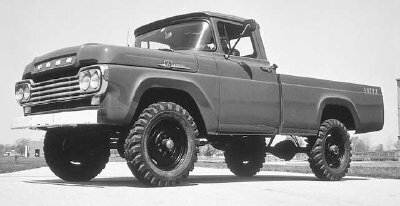 The 1959 model year was the first time Ford built light truck 4x4s in-house. Up to that point, they were farmed out to Marmon-Herrington (M-H) for conversion using a Dana 44 closed knuckle front axle. 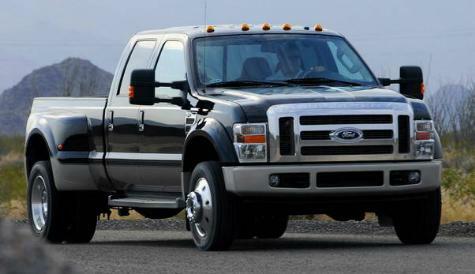 Today, Ford is still producing 4×4 Trucks and has been the best selling truck for 31-years. 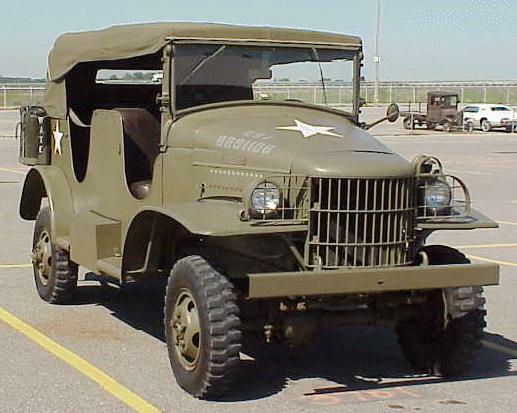 1940 – American Bantam – In September 1940, Bantam introduced the first 1/4 ton 4×4 to the Army. Built of a hodgepodge of outside-sourced parts and Bantam car leftovers, it set a new standard for 4×4 performance. The Army went ape. Later to be known as the Jeep, this type of vehicle broke new ground in the 4×4 world and started the general public on a love affair that has carried on to this day. Although Bantam only produced a little more than 2,600 similar 1/4 tons before being pushed aside by Willys, Ford, and the U.S. government, it is the true originator of this class of vehicle. 1951 NAPCO (Northwestern Auto Parts Company) – The date that NAPCO started to produce 4×4 conversion units is a little foggy. There are stories of GM trucks being converted as early as late 1949, but the earliest documented truck known of is a 1951 Chevy 3/4 ton owned by Butch Gehrig of Odell, Oregon. Until October 28th of 1954, when Chevrolet introduced the 1955 1st Series, all the conversions were done on 3/4 ton and larger trucks. The 1954 and earlier Advance Design 1/2 ton models were not suitable for a NAPCO conversion due to the enclosed drive shaft design. GMC and Chevrolet conversions were by far the most popular, though conversions were available for Ford, Studebaker and other manufacturers. NAPCO reached an agreement with both GMC and Chevrolet to supply them with the Powr-Pak conversion kits, and GMC began to produce 4×4 trucks on the factory assembly line (using NAPCO components) starting in 1956, with Chevrolet following suite in 1957. By the end of 1957 both GMC and Chevrolet trucks could be ordered from the factory with the NAPCO Powr-Pak conversion. 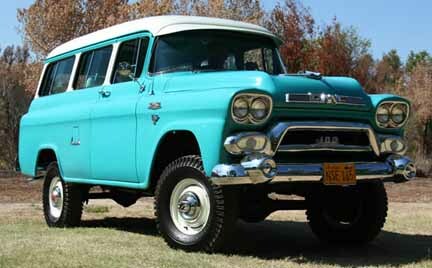 The first ‘All GM’ factory 4×4’s were introduced in 1960 when both Chevrolet and GMC went to a totally new chassis. NAPCO and its Powr-Pak conversion were left out of the equation due to the introduction of GM’s completely redesigned truck line featuring independent front suspension on the two wheel drive trucks and a 4-wheel drive specific chassis on the 4-wheel drive trucks. This was the beginning of the end for the 4×4 conversion element of NAPCO. Though they did produce conversion kits for a few more years, their main business shifted to the heavier trucks, 1-1/2 ton and larger. After the huge loss of the contracts with GMC and Chevrolet to supply conversion packages, NAPCO sold the rights to the Powr-Pak package to the DANA Corporation. All documentation, archives, information and parts were transferred to DANA at that time. During this evolution, the association of the NAPCO name with 4×4’s ceased to exist. The NAPCO 4×4 had vanished, just as it’s associated history, archives and NOS parts supplies were absorbed into DANA. 1956 GMC Trucks / 1957 Chevy Trucks – In 1956, GMC started building 4×4 trucks on the assembly lines using NAPCO components. Chevrolet followed in 1957 releasing their first production 4×4 pickups in 1/2, 3/4 and 1 ton sizes. Prior to this, these trucks had 4×4 conversions done by NAPCO in which the trucks were sent out for a NAPCO Powr-Pak 4×4 conversion and then returned. The first ‘All GM’ factory 4×4’s were introduced in 1960 when both Chevy and GMC went to a totally new chassis. NAPCO and its Powr-Pak conversion were left out of the equation due to the introduction of GM’s completely redesigned truck line featuring independent front suspension on the two wheel drive trucks and a 4-wheel drive specific chassis on the 4-wheel drive trucks. Today, GMC and Chevrolet still build and sell 4×4 trucks with GMC promoting their trucks as Professional Grade. So who first built the 4×4 in the United States? We may not know for sure. It seems there were many people experimenting with the concept. American Motor Truck Company and Duplex Power Car both started producing and selling 4×4’s around 1906, but there isn’t any clear record as to who was first. 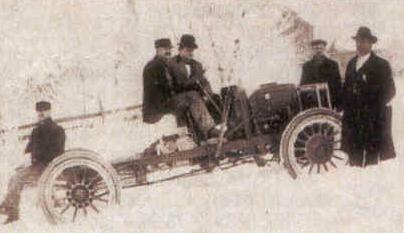 Otto Zachow tested and built a 4×4 with his brother-in-law, William Besserdich and patented it in 1908. They would build the FWD Corporation and Besserdich would later leave to form Oshkosh Motor truck Company in 1917. While both companies would survive, Oshkosh is still a very strong company producing some impressive heavy duty 4×4’s. Oshkosh is probably the longest producer of 4×4’s in the United States. The nod for the first producer of 1/2 ton 4×4 trucks would go to Marmon Herrington and the 1937+ Fords. The first factory (assembly line) built 1/2 ton trucks sold to the public would have to go GMC in 1956, Chevrolet in 1957, and Ford in 1959.